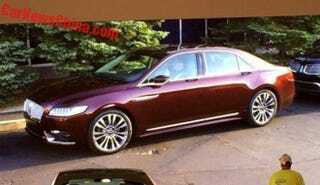 A grainy rendering of the production 2017 Lincoln Continental leaked on Thursday, and now we get to see a few actual photos of the car prior to its unveiling this week at the Detroit Auto Show. The folks at CarNewsChina caught the new Continental at a rehearsal for its official show debut, with the interior and exterior images below scrolling behind a white car on the stage. It looks similar to the Continental concept we saw early in 2015, but not quite as sleek on either the exterior or the interior. CarNewsChina reports that Lincoln will manufacture the Continental in both North America and China, and that the car will feature the twin-turbocharged V6 with 406 horsepower that we expected it to have. More interior photos from the new Lincoln can be found here, alongside a few spy shots of it on the street.